I began this call at St. John's in October of 2012. My wife Melinda also serves a congregation in New Auburn - Bethel Lutheran. Our three amazing boys (Nicholas, Jaden, and Dylan) all attend the Bloomer public schools. 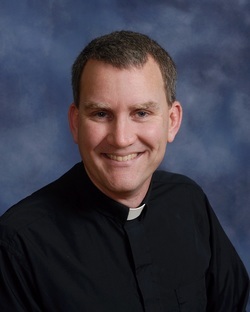 ​Now in my third call, I have served congregations in Rantoul, IL (American Lutheran) and at Michigan State University (University Lutheran) as an associate pastor. This is my first call as a solo pastor and St. John's has been a perfect place to do so as I serve people with open minds for positive change and renewed energy! I am thrilled to be back in my home state of WI, having grown up near Madison, in Fond du Lac, and finally Racine. I'm thankful that I will no longer receive dirty looks while cheering for the Packers, Badgers, Bucks, and Brewers! I am also involved in community affairs as the umpire coordinator for Bloomer Youth Baseball as well as serving on the Mayo Clinic hospital board. And on occasion you might even see this old man playing the trumpet with the high school pep band! The face of Youth Ministry at St. John’s Lutheran is always becoming and ever changing with the focus on discovering how Biblical truths from ages past are relevant in our fast paced world today. It is a privilege to share Gods’ stories with all ages from birth to adults, in areas such as preschool (little sprouts), Faith 5 (Kindergarten through 5th grade small groups), Confirmation (6th, 7th, & 8th grade middle school youth), as well as a women’s bible study group. We experience Gods plan and presence in activities such as mission trips, vacation bible school, summer camp, singing at nursing homes and cleaning nursery toys as we grow in faith together. My husband Pete and I have three grown daughters and their families which includes five grandchildren and one grand dog. I love unexpected adventures to Olson’s’ Ice Cream shop, any garden store, or antique/flea market where treasures can be found. Sitting in my backyard enjoying the flowers, picking blueberries and raspberries and popping them in my mouth, popcorn for supper, and getting a text from grandchildren are also some of my favorite things. I would be remiss if I didn’t include spending time with my church family at St. John’s. Come and See! You will be glad you did! "Hola," as my granddaughter would say. I grew up in Bloomer, received a B.S. System. I still have a great love for children! I have two sons and one grandchild. Hard to imagine that my grandchild is not spoiled! Both of my sons flew the coop a long time ago. I also have a dog named "Cupcake!". She and I take lots of walks together. mysteries around a "baking" theme. Authors that full this need are Diane-Mott Davidson, J. A. Whiting, and Leigh Ann Dobbs. These are just a few of my favorites in this category. I began my work at the church in January of 2015 cooking for the youth. My husband Tom and I have lived in rural New Auburn for many years. We have five grown children, eleven grand-children, and their partners and eleven great grand-children. All that are very special and make us proud. I have truly enjoyed cooking for the youth and the senior citizens. Cooking has always been very enjoyable to me. Hopefully the people I serve are pleased with my meals. In my free time I help at the food pantry. I also do several crafts and enjoy visits from the family. If all else fails I can sit and watch all our kittens playing in the yard. What a beautiful area we live in.